Calling all moms of diaper wearing kids! Be on the lookout for this Sunday’s paper because you’ll find a P&G insert that contains two high value coupons from Pampers! 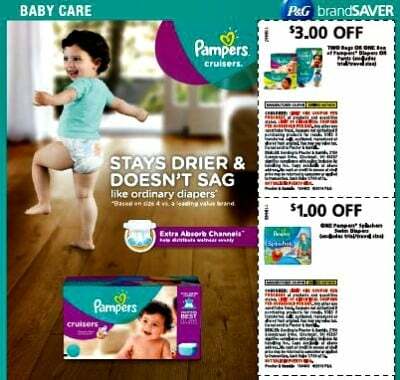 You’ll be able to clip a coupon for $3 off two bags or one box of Pampers Diapers or Training Pants! Plus, you’ll be able to snag a coupon for $1 off Pampers Splashers Swim Diapers…just in time for pool weather! 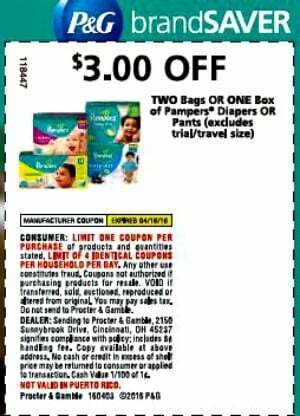 You can use these Pampers coupons on all Pampers Diapers and Pants except trial/travel sized diaper packs. The following Pampers products are included: Pampers Swaddlers, Pampers Cruisers, Pampers Baby Dry, and Pampers Easy Ups. To learn more about Pampers products, visit www.pampers.com. On the Pampers website, you’ll also be able to join the Pampers Rewards program plus discover ideas and information to help your baby get the most out of love, sleep and play. The best way to stay abreast of more money saving coupons and offers is to follow Pampers on social media: Facebook, Twitter, and YouTube.